I stopped by the White House Visitor’s Center, which is a few blocks from the White House, recently to see what might be of interest to Building Collector readers. Visitors can see a 3-D model of The President’s House by Rebecca Fuller, of N.C. an artist’s recreation based on written accounts of the pres house as the White house was then known at the beginning of Jefferson’s administration in 1801. In the last stages of completion, as you can still see construction on the grounds, the model represents the house when Jefferson first saw it after being sworn in on March 4.The visitors center gift shop, and the online version, sells a few items worth noting. Reproduced to scale, the Sandstone Model of the White House incorporates sandstone from the same Aquia, Virginia, quarry that produced the stone used to build the exterior walls of the real building more than 200 years ago. The North Portico and drive are seen above and the South Portico is pictured in detail. The sandstone model sits on a wooden base. A flat metal Bookmark of the White House is also available. As is a sandstone ornament with a detailed reproduction of the north and south façades of the White House enhanced with 24 karat gold finished brass. 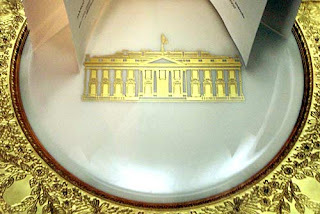 Also of interests was a White House Service Plate which was part of President Clinton’s set made in the year 2000 and features a gold White House design in the center.